A luxurious couture outfit in cashmere and silk. I would love to slip on your dress with its gorgeous collar with bound button detail. I bet it feels fantastic! A stunning and clearly well-made outfit! Thank you, Peggy. I expect to wear it for many years! The dress and jacket are beautiful! 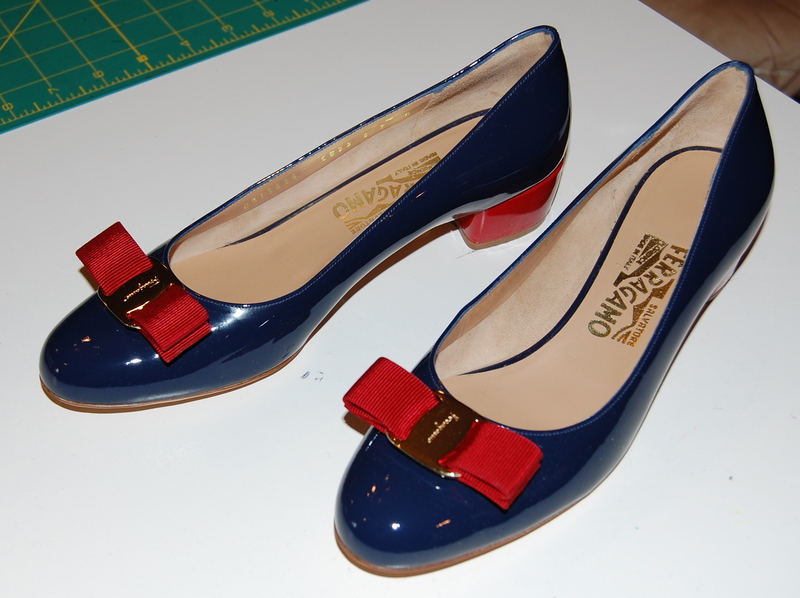 And… the Ferragamos are perfect! Glad you like the shoes! They were a splurge, but sometimes one just has to do these things! Very classy and elegant! Beautiful detail. Thank you, Tricia! I feel good in this outfit – and that’s always a good test. 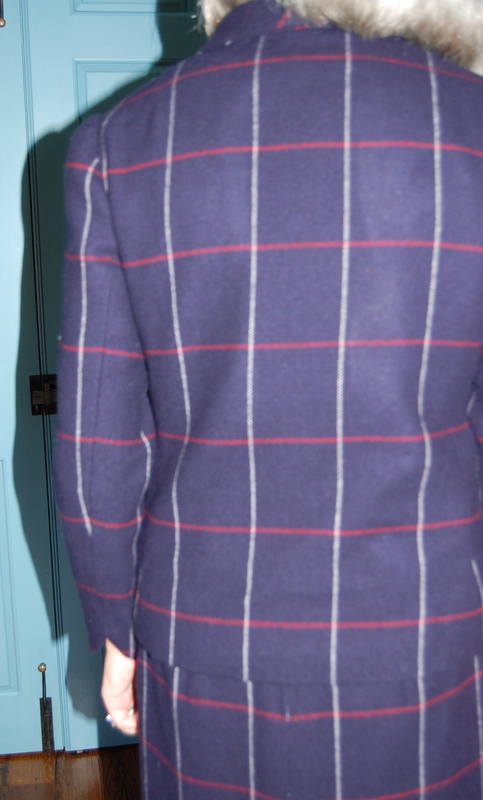 I love your pattern matching and attention to detail. 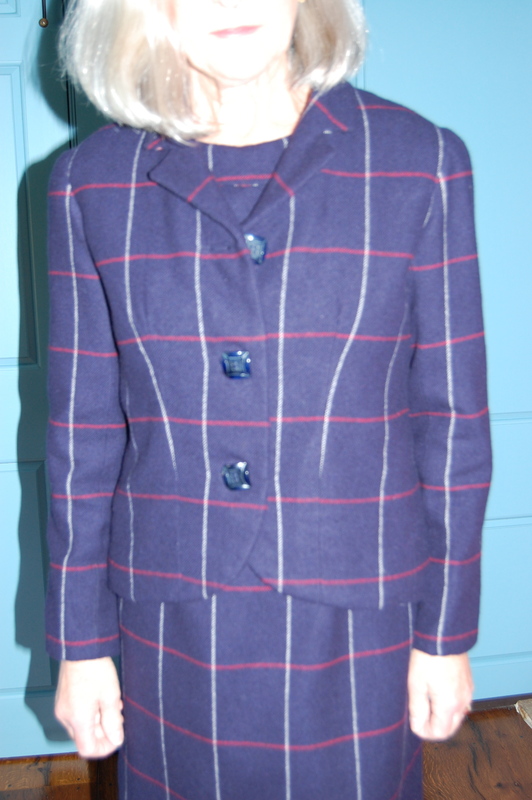 Hope it comes out of storage in early fall and gets a lot of wear till the weather turns hot — navy is a great, multi-season color — and you earned a pretty lining just for your own pleasure! Isn’t navy such a great color? I love it, although it makes taking photos a little difficult. The details were the fun part of this project! Beautiful outfit, head to toe! 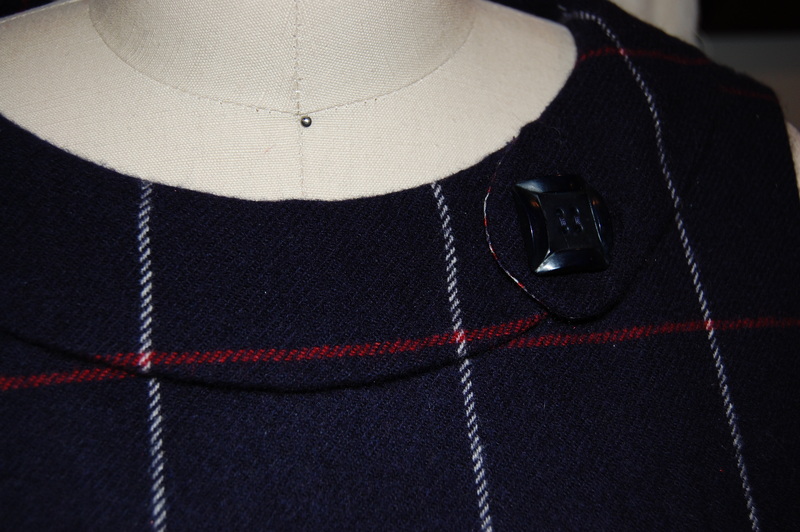 You are so right about the collar framing the face, it’s a lovely use of that extra button. 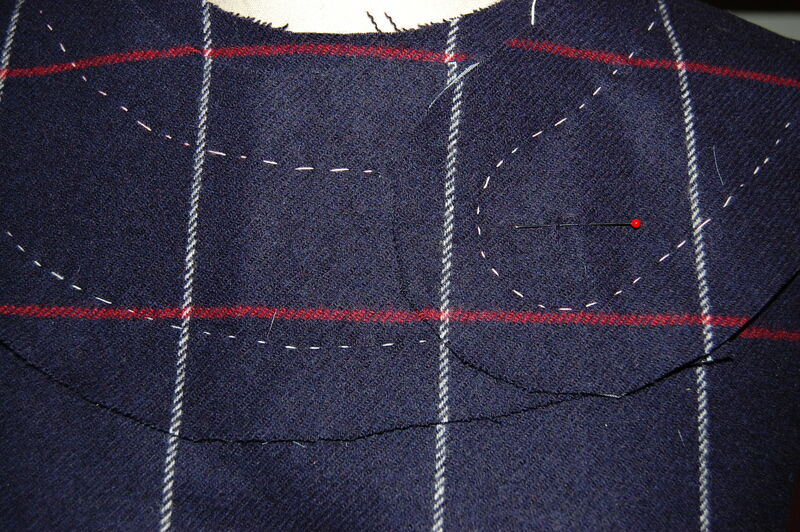 Your suit is a work of art, from the catch stitched insides to the perfect plaid matching on the outside! Thank you, Marianne, for your lovely comment. Sometimes it’s the inside details and the small outside details that add the most. Perfection, as usual! Love the addition of the collar on your dress! Thanks, Cissie! I like the collar, too, and I am glad I added it. Glorious! Love the collar on your dress too. 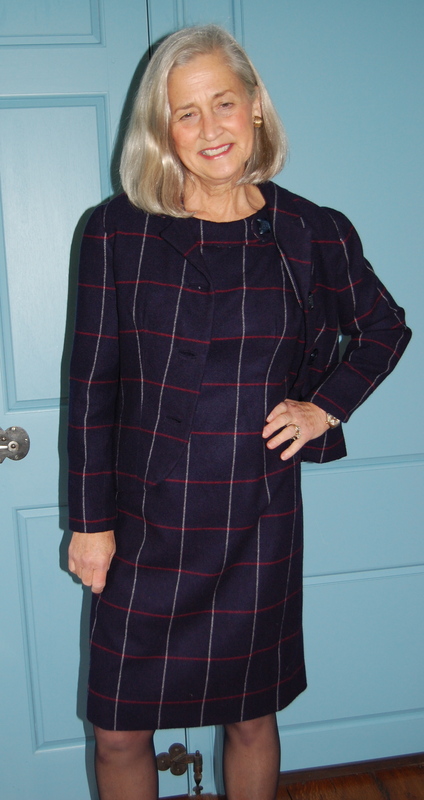 What is it about matching plaids and seams that is so captivating? I love the challenge of it, and then I am so glad if it all works out! Thank you! The shoes were the icing on the cake for me! 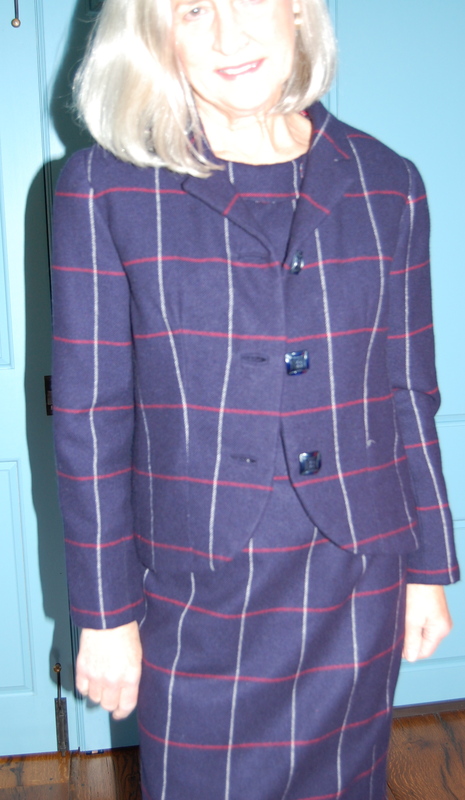 Amazing matching, the lines flow from the jacket to the dress. I love the collar, although the dress has a very up to date look, the collar is such a vintage detail. Beautiful job. Thank you! 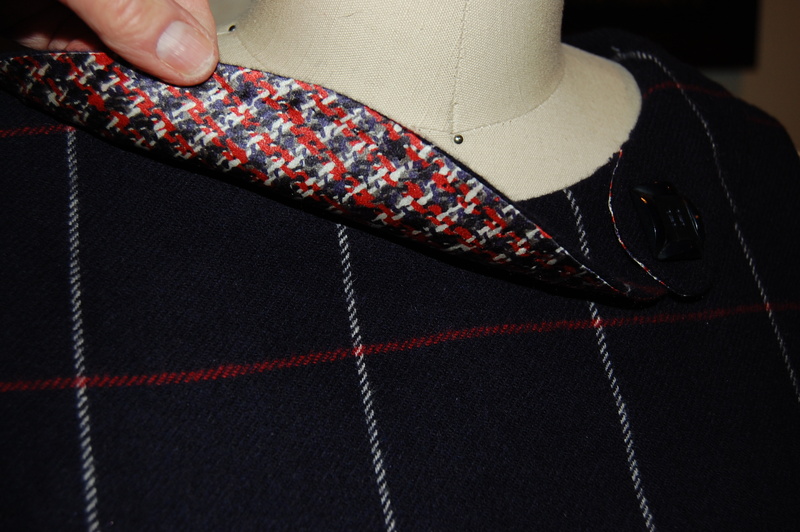 I had the same thought about the collar – vintage-inspired, but still contemporary. Your endorsement is appreciated. Love it! Definitely a great accomplishment. Thank you so much – it feels like an accomplishment, but that’s one of the joys of sewing, I think. I like working toward a finished product that I can hopefully be happy with! What a gorgeous dress and jacket! I’ve enjoyed following your progress and seeing the outcome. Very inspiring. Thank you. Thank you for following so diligently, Bernice, and thanks for your lovely comment! Wow! Gorgeous from tip to toe…literally! I’m having a flashback to the “ladies that lunch”,Jackie O and that gang, stepping out from LaGrenouille in NYC circa 1969! You did a wonderful job and are an inspiration to me. Lately I have put aside my rather complicated protects in favor of the jiffy ones and although it may be practical, it leaves me a bit sad for the days I took on something similar to what you accomplished here. So I just may start in on something soon! Your comment, Marguerite, makes me feel wonderful! Thank you! I’ll feel even more wonderful if you do tackle one of those more complicated projects and tell me all about it! Very pretty and so well made! I love the collar on the dress! I am delighted that you like the collar, too! Thanks, Linda! I’m fascinated by the high form of sewing you use. You may not be aware of this, but you’re part of the slow revolution and a subversive with your impeccably made, above fashion, creations.